. Published on June 19, 2012 . A while back, we announced that we were forming a company to push the envelope of human potential through positive reinforcement. Since then, we’ve been working very hard, but communicating very little. This post is to catch you up. We’re going to launch an iPhone app in August—a simple, positive way to achieve any goal. 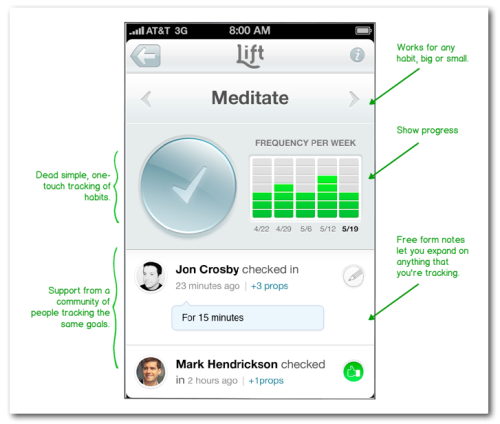 In our beta group, the Lift app has worked for health, fitness, productivity, happiness, and relationships. That’s a lot of good things, but there’s also a lot more work to be done. We think our first version will work for many users, but that we’ll spend a lifetime improving Lift so that it will work for everyone. We’re a four person startup and if you’re a fan of startups, want to work at Lift or just want to know more about who we are, then you should read our Work At Lift post. We’re all driven by the idea that we can make a giant impact on human potential through positive support. I’m going to go bold for a bit before coming back to the pragmatic. We want to eliminate willpower as a factor in achieving goals. Imagine smooth, fun, optimized, self-reinforcing paths for every aspiration. That would qualify as a giant impact on human potential. We think we can turn chores into positive draws. We’ll get there. Eventually. Step one is to make positive support loops generally available. A little bit of tracking of your goals paired with a little bit of positive support has gone a long way with many of our early testers and that approach is already working across hundreds of different goals. People make progress toward goals by either having major epiphanies (Eureka! moments) or through incremental improvements. We’re in the incremental camp because that’s how we experience sports, music, business, education and even our relationships with friends and family. Success often feels like it comes down to a battle with your own willpower. That’s no fun. Thankfully there are researchers like BJ Fogg, at Stanford, who break goals into tiny habits that are so small that you can’t help but get momentum. There are articles like this NY Times piece on Decision Fatigue, that explain how to work around the finite capacity of our willpower. There are books like The Power of Habit, by Charles Duhigg, which go into great depth about the success that comes by focusing on creating new habits. This growing knowledge about how to apply decades of psychology research in simple ways is what allowed us to build Lift. When you set a goal, think about what habits will support it. Proponents of habit design often work as if they have complete control of your environment. But they don’t. The secret defense for the chaos in your life is to develop mindfulness, or as one of our most successful friends says, “the ability to pay attention.” The universal tool for developing mindfulness is tracking. You could use a piece of paper, or, in August, you could use Lift. 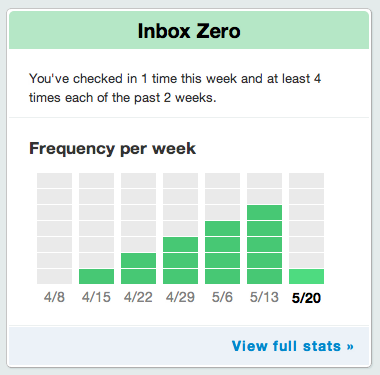 Lift is a habit tracking tool, which has some pros and some cons. Mindfulness is one of the biggest pros. Here’s a screenshot from the version of Lift that I have on my phone. Lift offers two feedback loops: visualized progress and support from a community of people with similar goals. When our beta testers report success they describe seeing their progress and wanting to beat it, seeing what other people are doing and feeling inspiration and accountability, and feeling great when they get recognition from other people. The feedback loops above evolved from an idea we had to gamify your life, which is a friendly way of making you as addicted to living a good life as you might be to playing video games or slot machines. We ended up dropping any semblance of gaming because we found the above feedback loops just as powerful and much more flexible. The core idea is the same though, to give some positive support to your goals. We talked more about moving beyond gamification in this AllThingsD article. We’ve also been influenced by a global movement of self-trackers who call their community Quantified Self (there is is probably a monthly meetup near you). People in this movement are inventing new tools to track and analyze every part of their life. Our goal was to put together a simple tool that would work reliably for all goals, so we had to hone in on the most powerful data to track: consistency. We’re serious about supporting all of your goals, although, in practice, people tend to have a lot of similar goals. Yesterday, 2 out of 5 Lift users tracked their flossing (including me). That’s an example of a supposedly trivial, fundamental habit that everyone’s been told to pick up and that most people will say they wish they did. But flossing has never had proper support (just bi-annual guilt from your dentist). Exercise habits are less trivial and we see a lot of activity in “Exercise” and “Go to gym.” These habits are also getting more social support. You’re much more likely to get props for having an awesome gym trip then you are for another day of flossing. The hardest habit in the community is “Don’t eat sweets.” The most interesting (to us) is “Talk to at least one stranger.” There are a lot of great stories in that one. Thank you for reading all of that. Now that we’ve broken our radio silence, we’ll be posting more to this blog and to our twitter. Make sure to follow us. We’d also like to hear more about you. If you have time, would you mind filling out this quick survey (this is also the place to go if we didn’t answer all of your questions)?